At the beginning of the year, ITSMA released a special 47-page report that outlines the steps marketers need to take to successfully integrate social media into their larger marketing strategies. Here Chris Koch, the Associate VP of Research and Thought Leadership forITSMA, shares insights into key points from the report. 1. You lay out three sequential steps for the social media process: monitor, engage, and manage. Why is it important for organizations to adopt this approach? Following this process prevents companies from approaching social media from a channel-by-channel perspective (i.e., What are we going to do on Facebook? What are we going to say on Twitter”). Plus, you can’t just jump into social media – at least not successfully. By monitoring, you get a sense of what’s being said online and can start thinking about what you can contribute to the conversation. You can then start creating a blueprint for engagement and begin recruiting participants. Once you are ready to up your commitment to social media, you can determine whether you want to start actively managing conversations through channels like blogs and online communities. Before taking this step, however, your employees should be comfortable with social media, because the resource commitment for managing the conversation is much higher and the business will demand a payback. 2. You say that that marketing is the catalyst for social media being used by others within the organization. Why will this internal campaign be one of the most important of marketers’ careers? Since 2010, our big theme at ITSMA has been marketing transformation. As of 2009, marketing budgets had dropped to their lowest levels – less than 1% of revenue – since we began measuring in 1996. With social media becoming a prominent channel, companies realize they have to re-organize how they market because they can’t just keep doing more with less. Marketing needs to play a key role in this shift because this all revolves around a fundamental transformation in terms of how marketing speaks to B2B prospects and customers. The one-way bullhorn has become a two-way conversation. 3. What do you tell marketers who are afraid of ceding control in the social media realm? What B2B companies forget is that their sales reps and subject matter experts have been having unmonitored conversations with prospects and customers for years. And we’ve seen that CIOs have relied on their peers for years when it comes to the research and purchase process. The only difference is that the conversations are now visible. Marketers might as well engage to influence the conversation. 4. ITSMA found that 87% of companies are using their existing staff to resource their new social media efforts, but only 15% have a formal training program in place. Why the gap and what are the dangers of not addressing it? One reason for the gap is that B2B companies – especially those in services and regulated industries – are slow to engage. Another reason is that social media has tended to grow organically within many companies. Employees – especially those in marketing and IT – tend to gravitate to it and participate on their own. Many companies fear that social media will lead to wasted productivity. But if organizations don’t take the lead and create a policy for how employees should be using social media, they’ll miss out on the benefits. Creating a social media policy and making it public as SAP, Cisco, and IBM have done signals to employees that you’re serious about engaging in social media. 5. How can companies best engage the right employees when a fast response is needed to something said online? Many social-media monitoring tools make it possible to kick off a process to respond to something online. If the process is ad hoc and isn’t written down and agreed to and supported through automation, it probably won’t happen. However, you can establish a process for dealing with, say, a negative Tweet, but if the mindset hasn’t changed within the company to address it rather than burying it, the process will be meaningless. 6. ITSMA has found that the most successful B2B communities are those that take advantage of existing relationships with the target audience and extend those relationships online. How can a company determine whether its audience relationships are likely to yield a strong online community? You need strong existing relationships and need to determine whether a strong online community already exists. More importantly, there has to be a fundamental value add for people to engage with your company in this way. In other words, what do they get via their participation that they can’t get by engaging with your company in other ways? If you can add value via a community, you need to link it to existing channels that your prospects and customers trust, such as your annual conference. By doing so, you increase the likelihood of people participating in the community. 7. You say the benefits of public communities are limited. Why? Those who manage communities say public communities lack the depth and safety that senior executives value. Executives want to talk to peers without anyone looking over their shoulder, and without being hounded by sales reps. Plus, they don’t have time to skim LinkedIn, Facebook, or Twitter. They need a community that’s targeted, focused, and heavily facilitated. 8. You point to Kronos as a company that established a successful blog aimed at decision makers and influencers. One of the key steps taken was to create a layer of separation between the company and the blog to establish credibility with influencers. How did Kronos establish this separation and what is its value? Kronos created the Workforce Institute, which is more than a blog. It’s a separate non-profit that conducts research and publishes thought leadership about the issues of workforce management. Kronos built toward this for years. It started in the 1970s making electronic time-card clocks. In the ‘90s, it realized it needed to look more broadly at how people used its products, and it came up with the “workforce management” concept. That emphasis on how customers use its products gave Kronos a natural way to create the institute because it had already been conducting research into this process. The institute has become a preferred source for customers to learn about changes in workforce management and the future of the segment. Kronos added the blog as a channel into this thought leadership. Companies need to be able to link their social media efforts with thought leadership or their success will be limited. Senior-level buyers in particular look for a strong point of view backed with data and proof points. I’m a firm believer that in B2B marketing, thought leadership has to come first. The way you create success in social isn’t by tasking subject matter experts to blog or Tweet a certain amount. Companies need to create an idea organization along the lines of McKinsey. You need to talk about the ideas and issues that affect customers. Your employees who are presenting at conferences have their finger on the pulse and are the ones who need to be involved in social media. Getting them to blog is a natural extension of what they’re already doing. 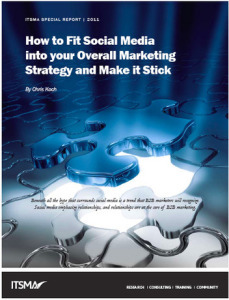 10.ITSMA has found that, because B2B marketers tend to approach social media in a channel-by-channel fashion, good ideas wind up being trapped within social media silos rather than being integrated into the larger thought leadership marketing strategy. How can marketers overcome this? First marketers need to shepherd idea development and idea dissemination in their organizations. In our previous interview, I explained how marketers can do this. Through this involvement, they can be certain that ideas won’t get trapped in silos. 11.You note that some large companies are setting up social media councils to share best practices, coordinate their activities across departments and geographic boundaries, and drive the integration of social media into the larger marketing strategy. Beyond publishing a social media policy, how can smaller companies achieve these objectives? It’s even more important for smaller organizations to establish a council, though it doesn’t have to be as formalized. The number-one stumbling block with social media and thought leadership is getting people to commit their time. One of the emerging, if not traditional, strengths of a good marketer is the ability to be a good diplomat. Marketers in smaller organizations need to call on this skill to negotiate with the powers that be to get permission for subject matter experts to participate. Then they need to inspire subject matter experts to want to participate. It used to be that marketing was very compartmentalized and had a fairly limited role. With social media and more people throughout organizations engaging in the online conversation, marketing now has a role that transcends the marketing department. This is similar to the shift in IT, which has become completely integrated across organizations and is the ambassador for business process transformation. Marketing is now the diplomat in charge of helping everyone across the organization effectively communicate via social media.